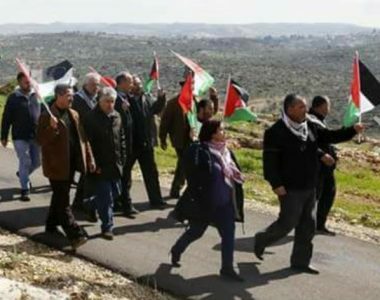 On Friday, dozens of Palestinians, accompanied by Israeli and international peace activists, held the weekly nonviolent procession against the Israeli Annexation Wall and colonies, in Bil’in village, west of Ramallah, in central West Bank. This week’s procession also came to protest the illegal recognition of U.S. President Donald Trump of occupied Jerusalem as the unified capital of Israel, and his decision to move to the U.S. embassy to the city, the Popular Committee against the Wall and Colonies said. The protesters marched carrying Palestinian flags, and chanted for national unity, ongoing resistance, the release of all detainees and the liberation of Palestine. They marched towards the gate of the Annexation Wall, separating the villages from their lands, and started knocking on it with stones. The procession was held despite the heavy rain, windy and cold conditions, the Popular Committee stated.